If you follow our blogs, you know we've extolled the remarkable beauty of the mandarinfish (Synchiropus splendidus) before. Their scale-less skin swirls with patterns in blue, green, yellow and orange, and they never fail to draw exclamations of ooh! when visitors spot one in the Living Corals exhibit. Just look at this fish! 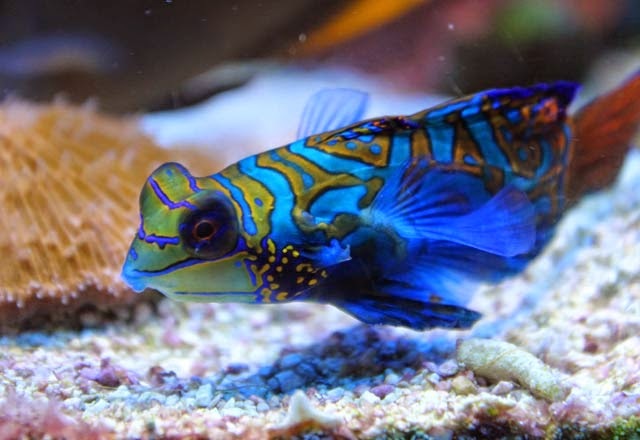 Some mandarinfish have darker hues, but all sport beautiful pattern of blues, oranges, greens and yellows. Well, now this exhibit is twice as beautiful because there are currently two mandarinfish, or mandarin dragonet as they're sometimes called, in the exhibit now. 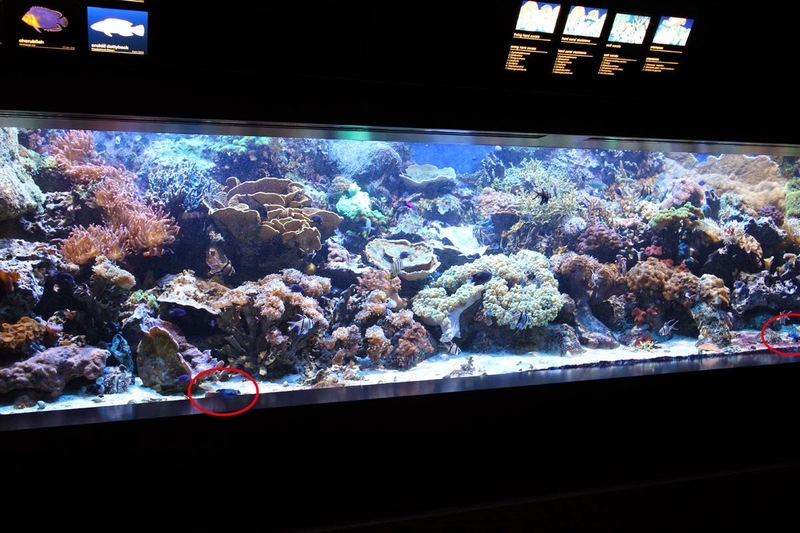 The red circles highlight the two fish. 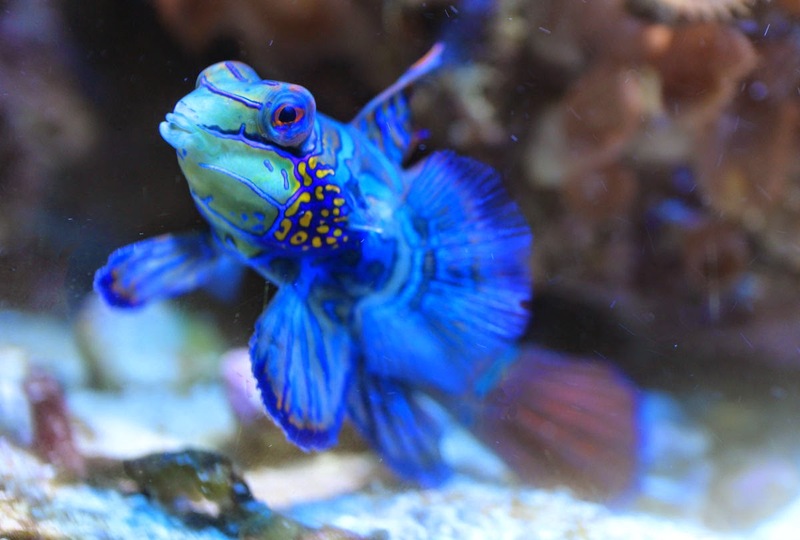 Mandarinfish can be a territorial species, so it can be tricky trying to maintain more than one at a time. In fact, we have tried to maintain two individuals in the tank before without much success. But these two seemed to have realized their differences and are ok with one another. Note how they are keeping their distance. Besides territoriality, mandarinfish are also very finicky eaters. 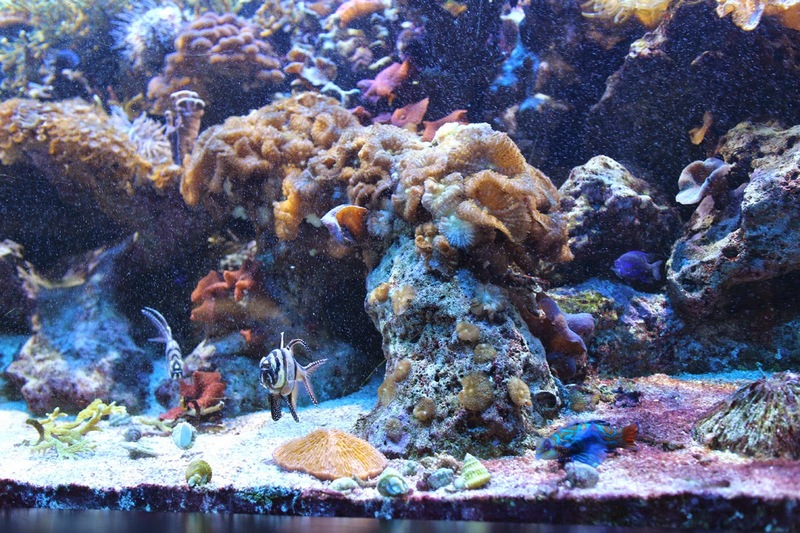 They slowly and methodically pick over the reef and gravel looking for small live foods such as copopods and amphipods. Look for the fish hovering using their front fins while looking for food. 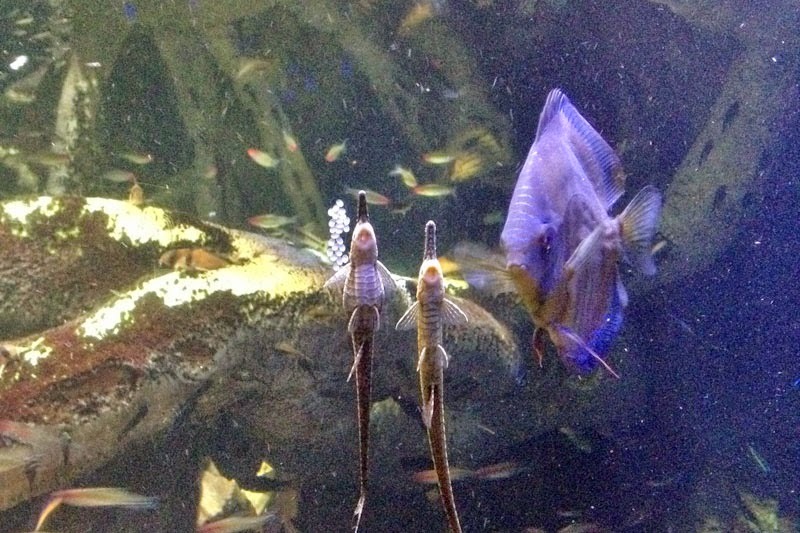 Fortunately, our aquarists are skilled at providing these fish the food and care they need. So on your next visit to the Aquarium, indulge in a good, long look at the Living Corals exhibit if you can. See if you can spot both of the mandarinfish amid the bobbing Banggai cardinalfish, dashing clownfish, corals and anemones. The mandarinfish is also a regular on our social media outlets. Be sure to follow us on Facebook, Twitter, Tumblr, Google + and Instagram for your daily dose of awesome ocean animals! The cuttlefish exhibit is squirming with some new tentacles these days. There are currently two species hovering about this exhibit in the tropical gallery right now. Let's get to know these cunning cephalopods! First up, the pharaoh cuttlefish (Sepia pharaonis). These cuttlefish are juveniles, only around 3 to 4 months old. They will get considerably larger than their neighbors, the dwarf cuttles. Pharaoh cuttlefish differ from the common cuttlefish in that around their mantle, they have a blue iridescent ring of color. 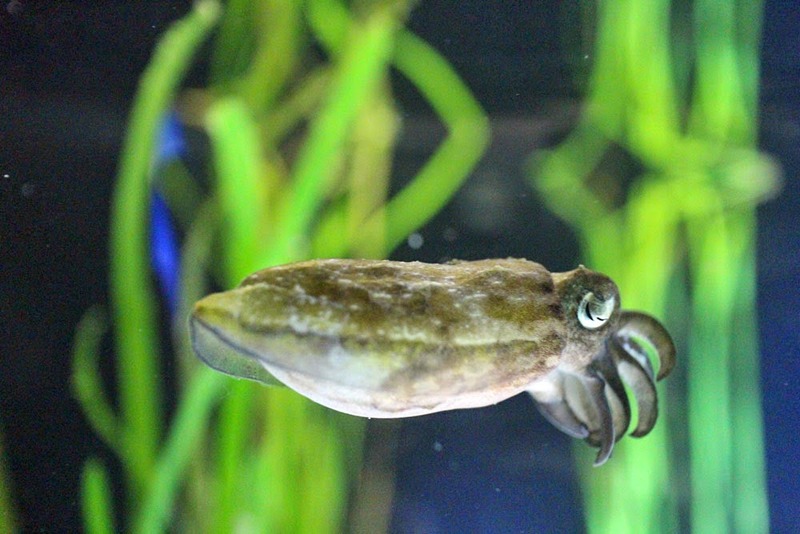 Visitor Sarah Anders shared a fascinating video of cuttlefish behavior on our Facebook page. You can see one cuttlefish approach another one, and it appears that it thinks the tentacles of the other one are food. It isn’t until the whole cuttlefish moves that the aggressor seems to stop trying to attack the tentacles. 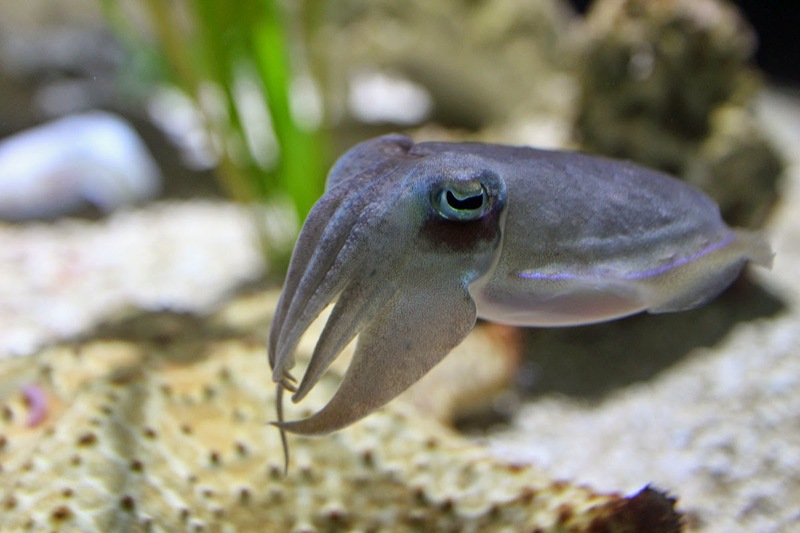 Cuttlefish appear to raise their tentacles in that way as a sign of defense or warning to another animal. This video is a nifty display of just how well cuttlefish can camouflage themselves! blending into the sandy substrate. 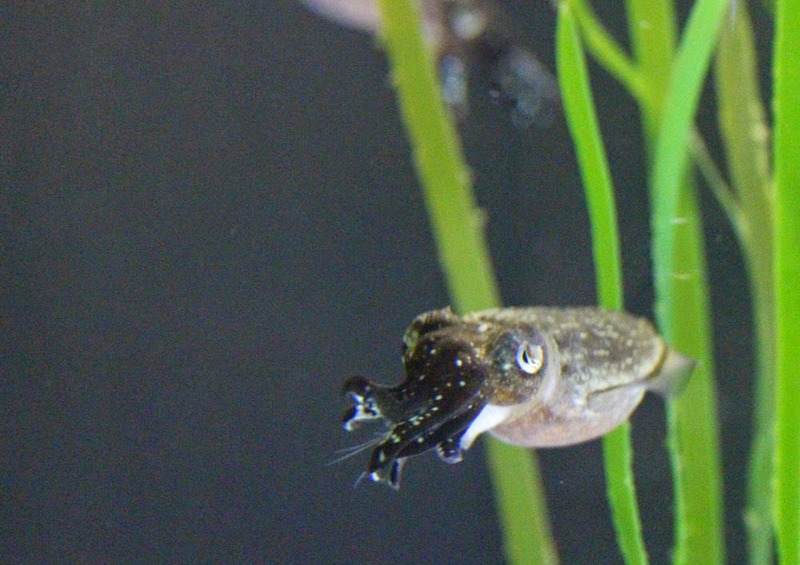 Don't miss the dwarf cuttlefish (Sepia bandensis)! This species tends to hang more towards the surface and you'll notice they have a more bumpy skin pattern with more purple tones in them. They are as big as they will get! or to communicate with fellow cuttlefish. These species can be on exhibit together now since they are all about the same size as each other. At some point the pharaoh cuttlefish will outgrow the dwarf cuttlefish and we will have to take the dwarf cuttles behind the scenes. So hurry in to see these two species on exhibit while you can! 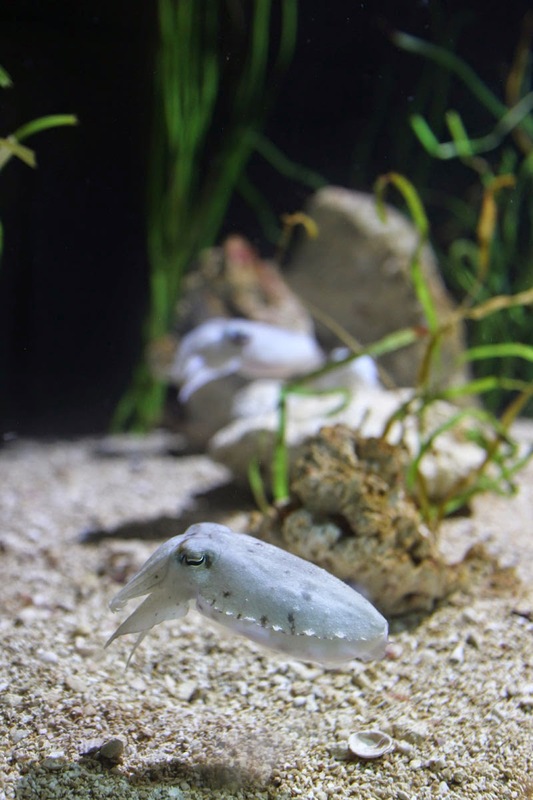 Did you know cuttlefish lay eggs? Twig catfish (also known as farlowella) get their name from their elongated twig-like appearance. We have several in the anaconda exhibit that can usually be found right upfront, sticking against the glass by their mouths or creeping along the sunken logs. They are algae eaters, after all, grazing on the algae is how they earn their keep. 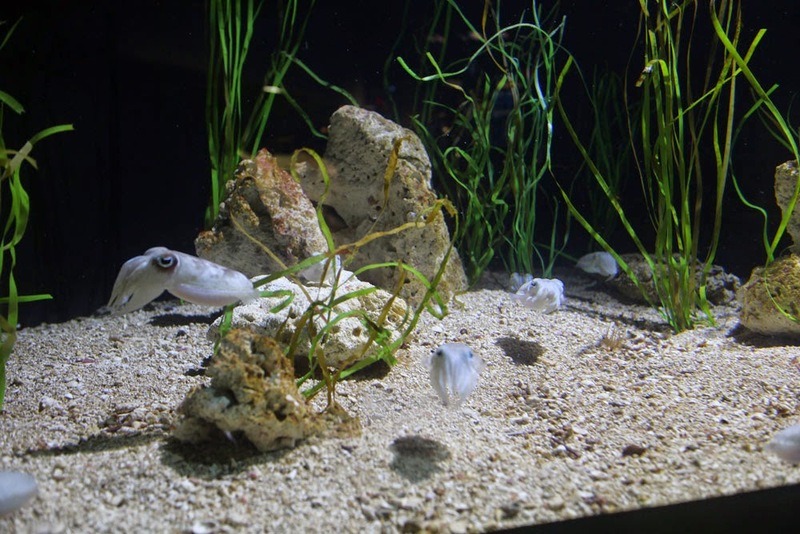 Some of the fish have paired off and are treating visitors to a very special sight: eggs! Twig catfish usually lay eggs on open vertical surfaces such as submerged vegetation or rocks—or in this case, the window. The eggs lie in a single layer and are guarded by the male. You'll find this highlight in the anaconda exhibit. 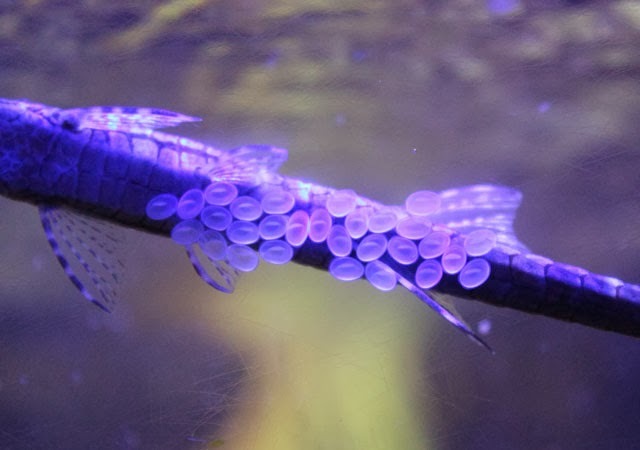 Which is more exciting—giant snakes or tiny fish eggs?! The males have their work cut out for them. 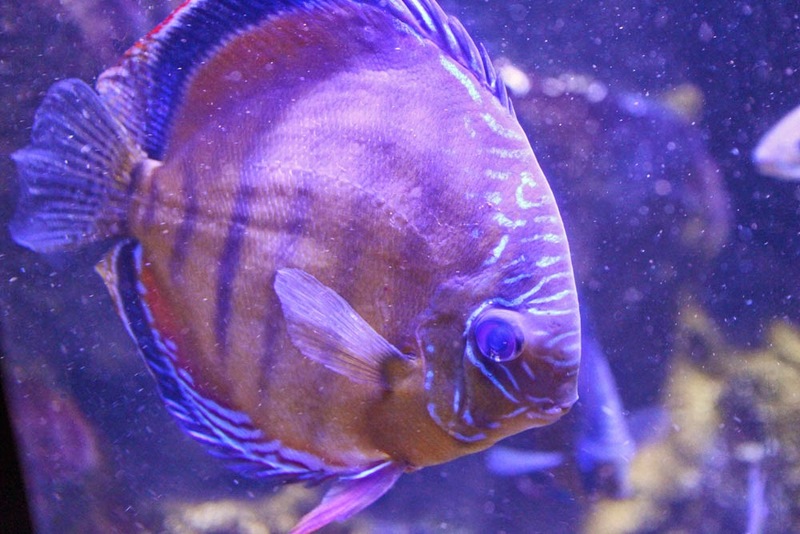 Large discus in the exhibit are eyeing the tasty clutch of eggs, so the farlowella are having to stay on guard. In this video you'll see how the catfish have to swat at the ever-present discus. If the farlowella manage to protect their eggs from predators, the larva will hatch into the exhibit. Though, just like in the wild, most do not survive. Either way the eggs can only be seen on exhibit for a couple days. 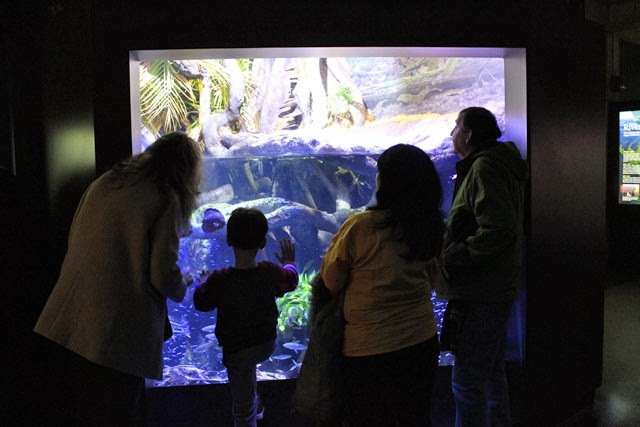 The next time you visit the Aquarium, head up to the Amazon Rainforest exhibits. You might just see a very cool fish behavior right before your eyes! Plus, a glimpse of a steamy tropical rainforest is a great way to escape the snow. Just sayin'.